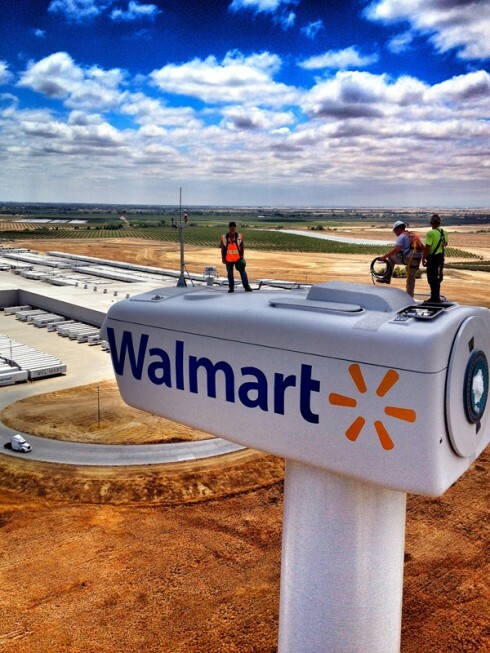 The Red Bluff, California Walmart distribution center was revealed as its first on-site industrial sized wind turbine pilot project. With a height of 265 feet tall, along with a diameter of 250 feet, the new GE 1.0 megawatt (MW) wind turbine will create close to 2,200,000 kilowatt hours (kWh) yearly, the statement said. Foundation Windpower, as part of a Power Purchase Agreement (PPA) with Walmart, will manage, install and own the turbine. Meanwhile, Walmart will buy the power under the agreement. It’s also expected the PPA will provide energy savings, along with a guaranteed price for the electricity created. The on-site wind turbine at Walmart’s distribution centre is just some of the sustainable development initiatives the large corporation has spearheaded lately in its drive to push renewable energy use. Some other projects include the recent 100th solar installation in California, 348 Mexican Walmart stores being supplied by wind power, and 26 fuel cell sites in California providing local energy to Sam’s club and Walmart stores. This entry was posted in Alternative Energy, Wind Power and tagged climate, environment, RED BLUFF CALIFORNIA WALMART WIND TURBINE, science, transportation, travel, vacation, WALMART, WALMART SUSTAINABLE DEVELOPMENT, WALMART WIND ENERGY by fenleynicol. Bookmark the permalink.